All Kingdom award recipients are recorded in Canon Lore online – a searchable database that contains the roll of arms and order of precedence for individuals and groups of Lochac. Lochac’s College of Heralds published a quick-reference guide to the awards of the Kingdom of Lochac, accurate as of August AS49. This visually depicts the order of precedence and theme for many of Lochac’s Kingdom-level awards. Lochac’s College of Heralds is responsible for maintaining the Kingdom Award Ceremonies. These ceremonies can be downloaded from the College’s website. The Augmentation of Arms is a special and very rare honour. Given only a few times in the history of the Kingdom, it entitles the recipient to register an addition or alteration to their Arms in consultation with the awarding Crown. An Augmentation of Arms may be granted to a group or individual at the discretion of the Crown. In the case of an individual, it would normally be for exceptional and/or prolonged service to the Kingdom of Lochac. 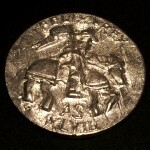 There is no official token for this award, however, sometimes a token bearing the arms of Lochac is presented to the recipient. An unofficial token for Lochac’s Augmentation of Arms award, photo by TH Lady Ceara Shionnach. The Award of Arms is given for service or other significant contribution to the well-being of the Kingdom, usually at the local level. Gentles granted an Award of Arms are entitled to be addressed as Lord or Lady. 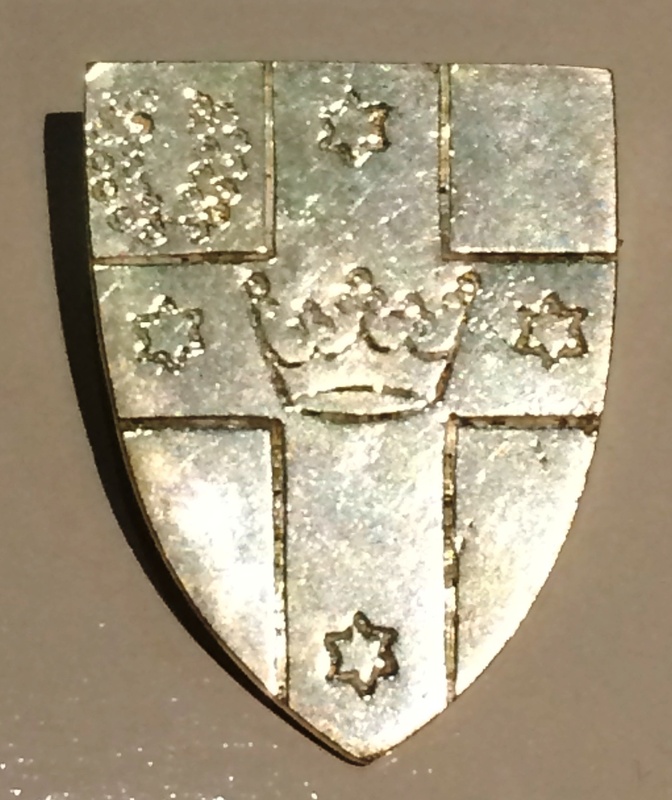 This award also has the effect of converting devices previously registered with the College of Heralds to Arms. In Lochac, recipients of this award either receive a scroll or a promissory for a scroll in the future. The scrolls are usually illuminated and calligraphed by Lochac’s Guild of Scribes and may be styled in a reign-specific or individual manner, or could be from a pre-printed template. From July 2010, the writ system was implemented by the College of Scribes to replace the instant scroll process that was previously in place. The writs have a seal of green wax fastening them. 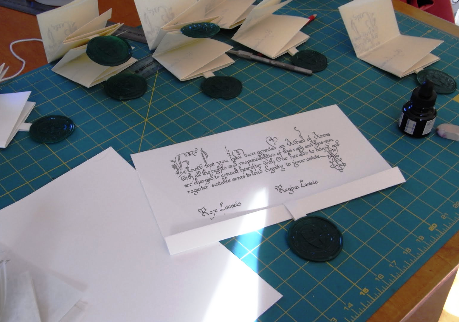 Examples of Lochac’s writs for Award of Arms recipients, sealed with green wax stamped with the Great Seal of State, photo by Mistress Cairistiona nic Bheathain. There are many examples of the stunning Award of Arms scrolls completed by Lochac’s College of Scribes in an online photo gallery. The title of Champion of Lochac is given to the runner up in the Crown Tournament for the duration of the reign. If both King and Queen are unable or unwilling to complete a reign, the Champion of Lochac shall reign as Regent, crowning the next King and Queen, and having the power of a regent, except they may not change the laws of Lochac or give out awards. 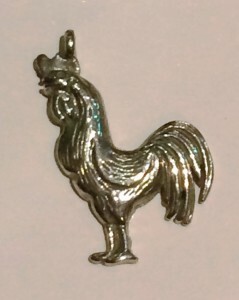 The Order of the Cockatrice may be given to those who have distinguished themselves over time by showing outstanding skill in the Arts & Sciences. They shall also have demonstrated chivalry, courtesy and courtly behaviour. Elevation to this Order shall confer upon the holders a Grant of Arms, if that person is not already a holder of a Grant of Arms. All bearers of Grants of Arms are entitled to be addressed as The Honourable Lord/Lady. The silver token for the Order of the Cockatrice depicts a rooster, photo by TH Lady Ceara Shionnach. The Order of the Coronaria was given retrospectively to all Viscountesses and Vicereines of Lochac (i.e. 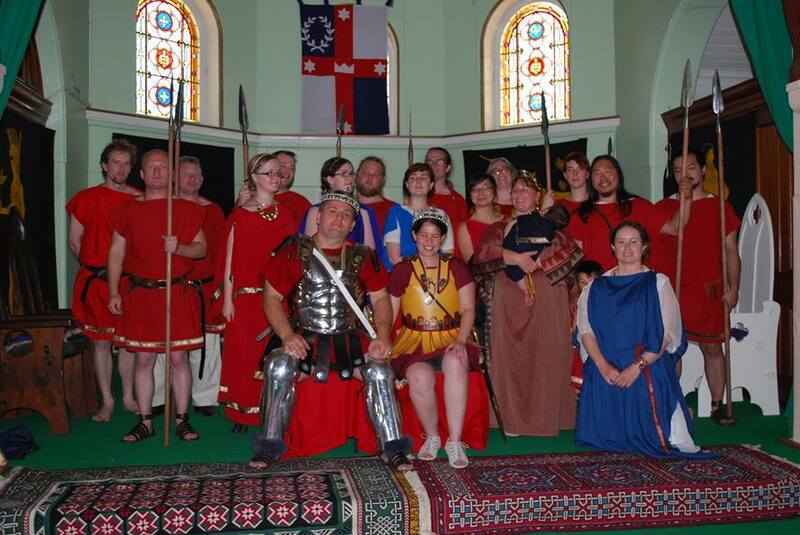 consorts who Reigned prior to Lochac being elevated to Kingdom status) on the 5th of November AS50 (2015) by King Steffan and Queen Branwen – 27th Crown of the Kingdom of Lochac. Members of this Order are charged with supporting and assisting the Crown and Their Heirs, and encouraging chivalric and courteous behaviour among all members of the Society. The order is non-armigerous, and there is no official token for the award. The County is granted to those persons who have reigned over a kingdom, and is granted at the end of the first complete reign. The token is an embattled coronet. A County entitles recipients to be known as Count or Countess, and to be addressed as Your Excellency. 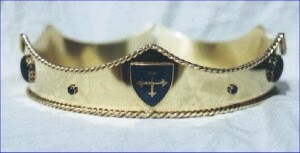 Example of an embattled coronet – a symbol of the County – photo by Lochac Regalia. The title of Court Baron or Court Baroness may be offered to those the Crown wishes to honour, for those whose contributions have enriched the Kingdom in unique ways. It is also often given to Landed Barons and Baronesses at the conclusion of their tenure. The symbol of the award is a low coronet of 6 points. In Lochac this title carries with it an Award of Arms, and the title of Court Baron/Baroness may be used by all who attain this title. Court Barons and Baronesses are entitled to be addressed as Your Excellency. 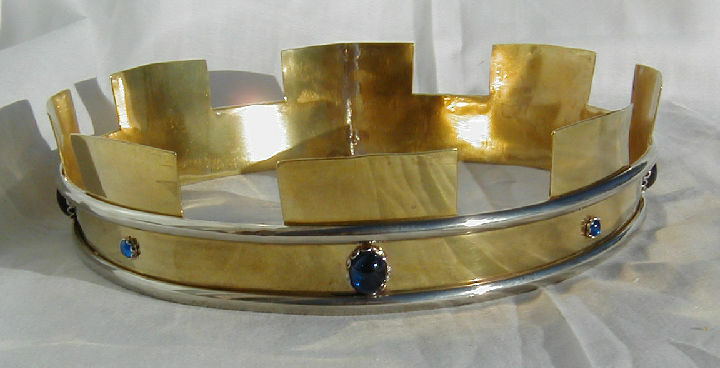 Example of a coronet with 6 low points – a symbol of the Court Barony – photo by Lochac Regalia. The Order of the Cross of Lochac may be given to those who have performed service to the Kingdom, but who are not citizens of Lochac. A representation of the Southern Cross is used in association with this award, though there is no official token. The Crown may award a King’s, Queen’s, Royal, or Lochac Cypher to those who have been thoughtful and helpful personally to the King, Queen or Crown. The token varies and is unique to the reign. A person might receive several cyphers from different reigns. 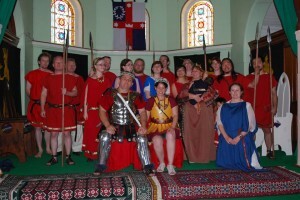 Some examples of past cyphers include rose bushes, badges, pendants, coins, brass arm bands, and spears. 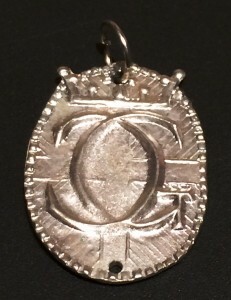 Pewter badge cypher from the reign of Gabriel II and Constanzia II. Photo by TH Lady Ceara Shionnach. 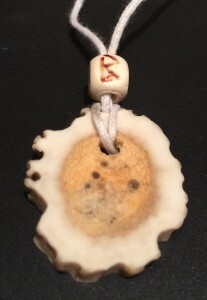 Bone pendant cypher from the reign of Henri I and Beatrice I. Photo by TH Lady Ceara Shionnach. 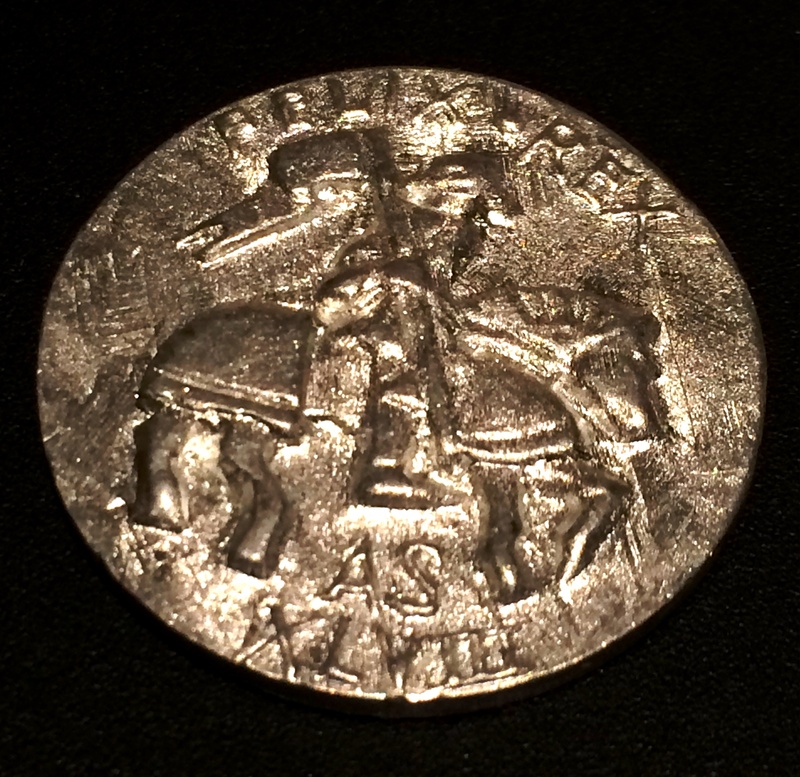 Coin cypher from the reign of Felix I and Eva I. Photo by TH Lady Ceara Shionnach. The members of Alfar III and Angharat I’s Royal Guard were each given a spear as a cypher. Photo by Holmkel of Attica. The Duchy is granted to those persons who have reigned over a kingdom two or more times, at the end of the second complete reign. The token is a coronet adorned with strawberry leaves. A Duchy entitles recipients to be known as Duke or Duchess, and to be addressed as Your Grace. Example of a coronet adorned with strawberry leaves – a symbol of the Duchy – photo by Lochac Regalia. 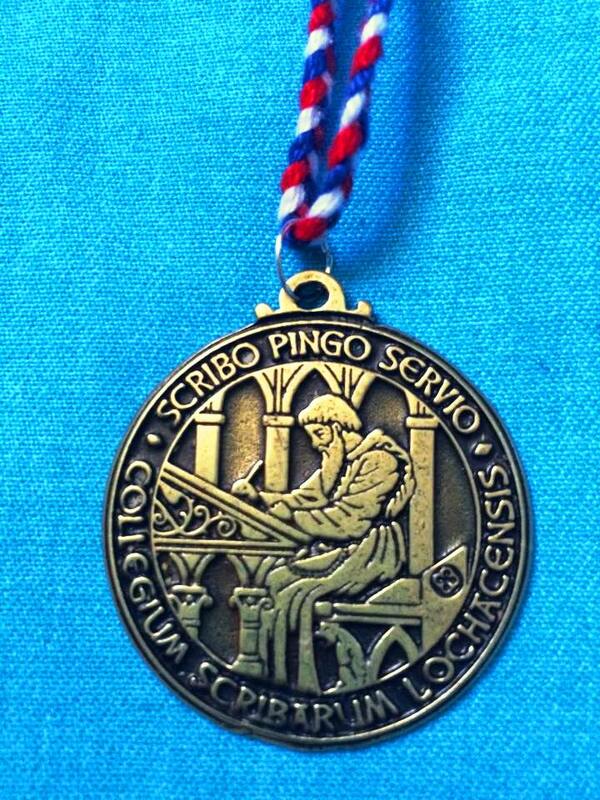 The Golden Poyntel is given to those who consistently produce remarkable scribal work, teach of the scribal arts, and otherwise serve the College of Scribes. A poyntel is a multi-purpose wooden or metal scribal implement, used both to score lines for writing, and to mark under-drawings for illumination. 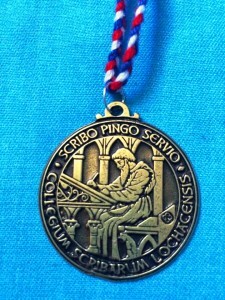 The token of the award is a golden medallion, made by Mistress Joie Tigre d’Argentona. The award token for the Golden Poyntel. Photo by Baroness Ginevra Lucia Namoraza, January 2015. The Golden Sword is given for achievement in the field of heavy fighting. The token is a pendant displaying an eagle grasping a sheaf of arrows in its claws, though sometime the token awarded is simply a sword. The Order confers an Award of Arms to the bearer, if they are not already armigerous. 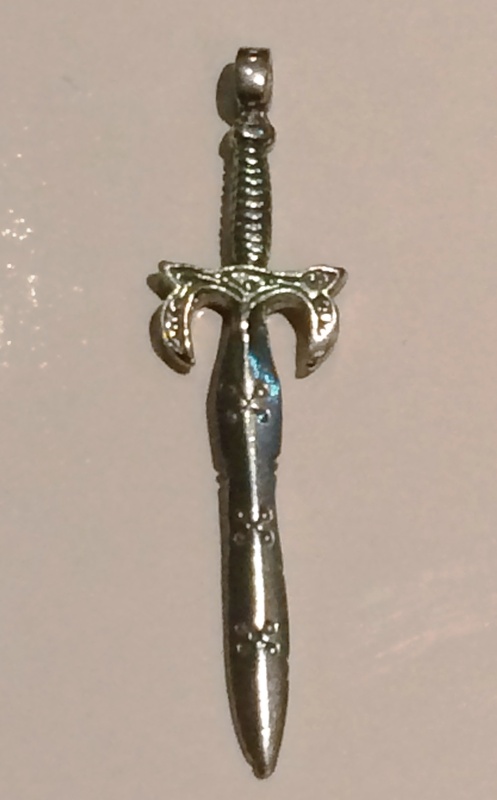 A token depicting a sword may be given to the recipient of the Golden Sword, photo by TH Lady Ceara Shionnach. The Golden Tear is given for substantial and unobtrusive service to the Kingdom. The token is a pendant in the form of a golden drop. The Order confers an Award of Arms to the bearer, if they are not already armigerous. 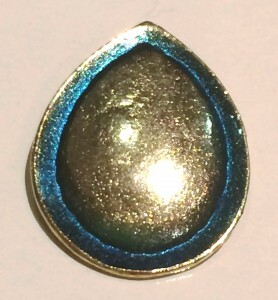 The tear-drop shaped pendant given to recipients of the Golden Tear, photo by TH Lady Ceara Shionnach. The Grant of Arms is given to mark the service of Greater Officers of State, or as acknowledgement of activity in any field of endeavour at an equivalent level to the Greater Officers of State fulfilling their duties. There is no badge or token. Recipients may style themselves as The Honourable Lord or Lady. 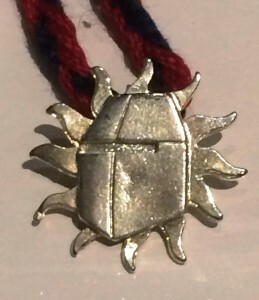 A token that may be given to the recipient of the Order of the Hector, photo by TH Lady Ceara Shionnach. Those who have been of great assistance for sustained duration to the college of Heralds may be given the status of ‘Herald Extraordinary’ and given a personal heraldic title – their choice of any heraldic name that can pass registration. The Lochac Order of Grace is given once per reign to that person the Queen (or the Princess, when Lochac was a principality) regards as having displayed exceptional courtesy. The token is a purse bearing the Order’s badge: Gules, a hind courant Or between three mullets of six points argent. The Order confers an Award of Arms to the bearer, if they are not already armigerous. There is no set style for the pouch and, as such, recipients are often gifted a pouch bearing the Order’s badge in a style relatively consistent with their persona. 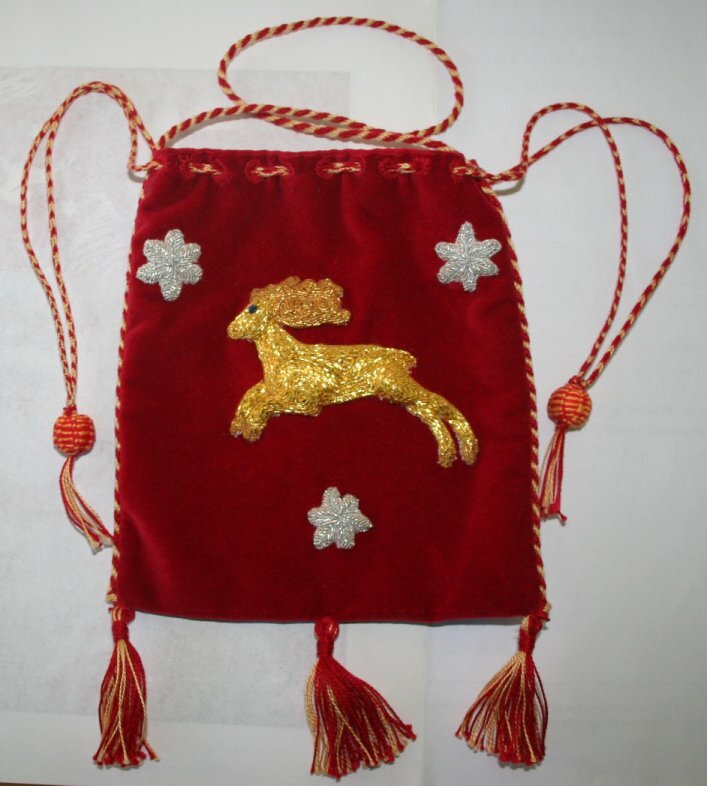 One example of a pouch that may be given to the recipient of Lochac’s Order of Grace, 16th century style bag by TH Lady Ceara Shionnach, photo by Mistress Rowan Perigrynne. The Miles Regni (Soldier of the Kingdom) is given to those who have supported the army of Lochac in any significant manner, including siege weapons and non contact participants. 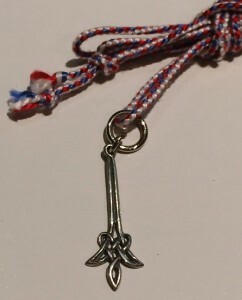 The token is a silver sword, worn as a pendant. The Order confers an Award of Arms to the bearer, if they are not already armigerous. The Mouse Guard is given in recognition of the contribution given to our Kingdom by children between the ages of 4 and 13 years. This award does not preclude our young people from gaining any other Lochac award that they may fittingly receive. One example of a pouch that may be given to the recipient of the Mouse Guard, photo by Mistress Rowan Perigrynne. The Nock is given for achievement in the field of missile combat. 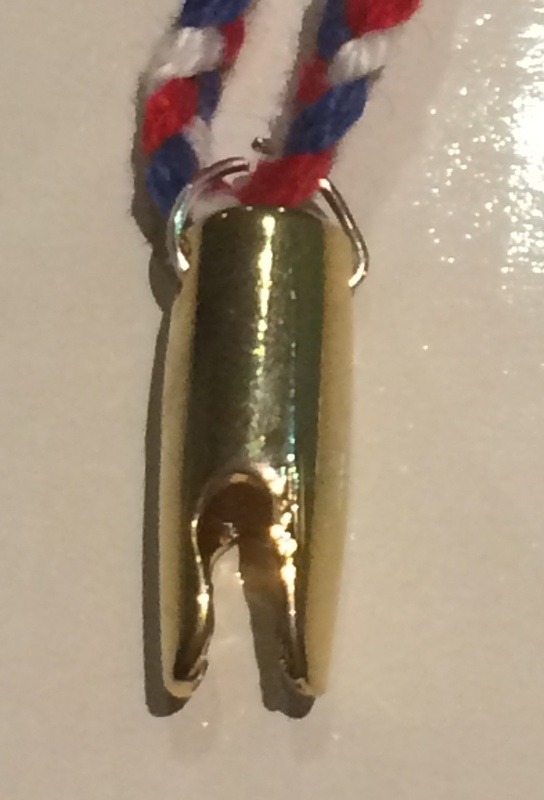 The token is a gold nock, worn as a pendant. The Order confers an Award of Arms to the bearer, if they are not already armigerous. The token for the Order of the Nock is a golden nock worn as a pendant, photo by Ceara Shionnach. The Order of Prometheus is given for excellence in teaching. 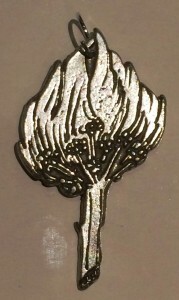 The token is a pendant showing a flaming branch of fennel (promethean flame). The Order confers an Award of Arms to the bearer, if they are not already armigerous. 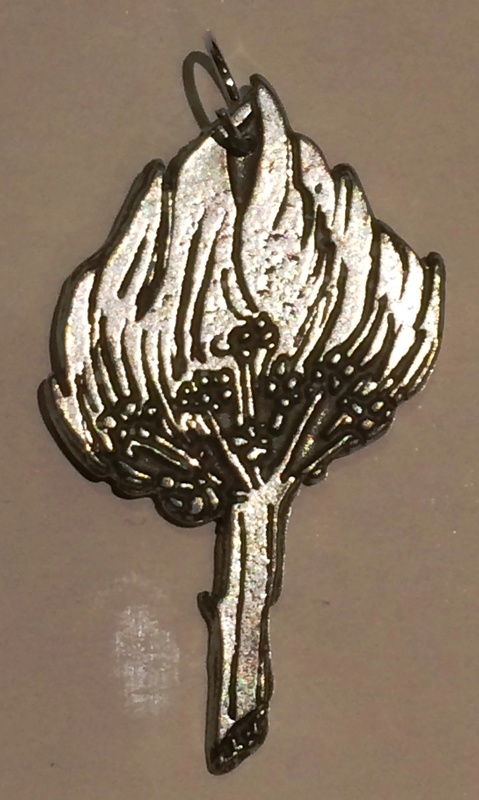 The token of the Order of Prometheus is a silver pendant depicting a flaming branch of fennel. Photo by TH Lady Ceara Shionnach. 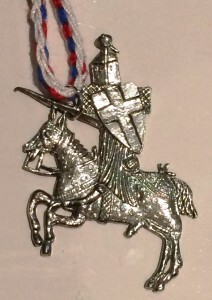 The Order of the Rapier is given for achievement in the field of Rapier fighting. 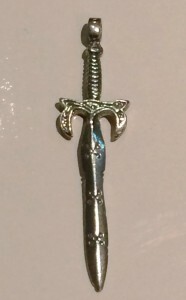 The token is a gold rapier, worn as a pendant. The Order confers an Award of Arms to the bearer, if they are not already armigerous. The token of the Order of the Rapier is a sword pendant, photo by Ceara Shionnach. The Order of the Red Wyvern may be given to those who have distinguished themselves over time by performing outstanding service and great prowess in the Martial Arts. They shall also have demonstrated chivalry, courtesy, and courtly behaviour both on and off the field of combat. Such prowess can include skills in Armoured Combat, Archery, Rapier, the Equestrian Arts, Siege Warfare, or Leadership on the warfield. Elevation to this Order shall confer upon the holders a Grant of Arms, if that person is not already a holder of a Grant of Arms. All bearers of Grants of Arms are entitled to be addressed as The Honourable Lord/Lady. 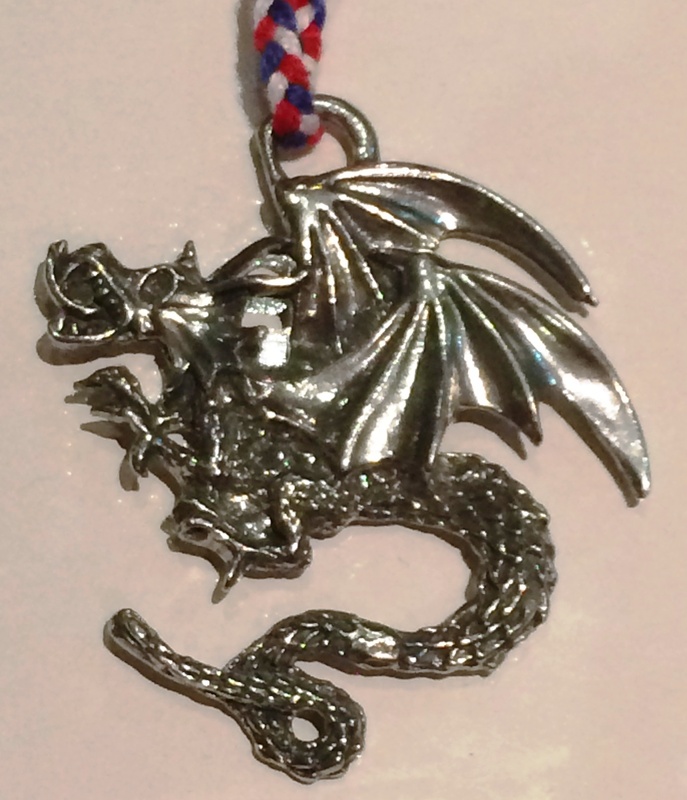 The token for the Red Wyvern is a silver pendant depicting a basilisk, photo by TH Lady Ceara Shionnach. The Rowan is given to those who have displayed exceptional and consistent grace and courtesy to all. The award was named in honour of one of the founding members of Lochac – Rowan Perigrynne. The Order’s badge is: A cinquefoil per pale vert and argent. 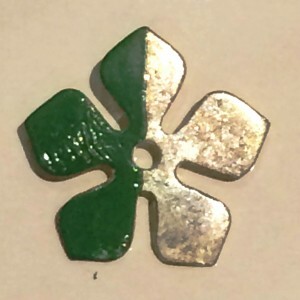 The token for the Order of the Rowan is a pendant in the shape of a cinquefoil, half green and half silver, photo by TH Lady Ceara Shionnach. The Silver Helm (formerly the Shining Helm) is given to those combatants who consistently present a good looking and period appearance on the field. The token for the Silver Helm is a pendant in the shape of a helm with light shining behind it, photo by TH Lady Ceara Shionnach. 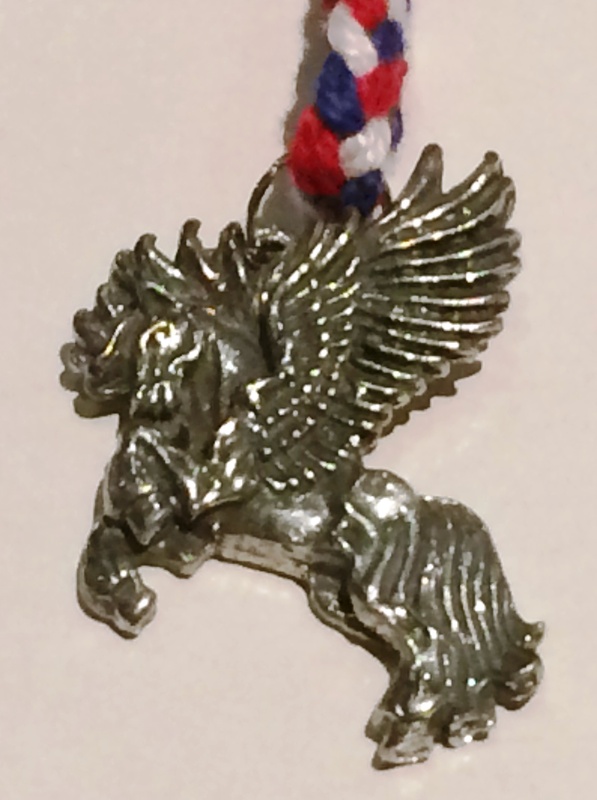 The Order of the Silver Pegasus may be given to those who have distinguished themselves over time by performing outstanding service. They shall also have demonstrated chivalry, courtesy and courtly behaviour. Elevation to this Order shall confer upon the holders a Grant of Arms, if that person is not already a holder of a Grant of Arms. All bearers of Grants of Arms are entitled to be addressed as The Honourable Lord/Lady. 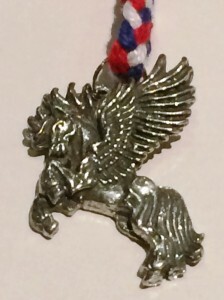 The token for the Order of the Silver Pegasus is a silver pendant depicting a winged horse, photo by TH Lady Ceara Shionnach. The Order of the Star and Lily (formerly known as Golden Lily) is given for achievement in the arts and sciences. 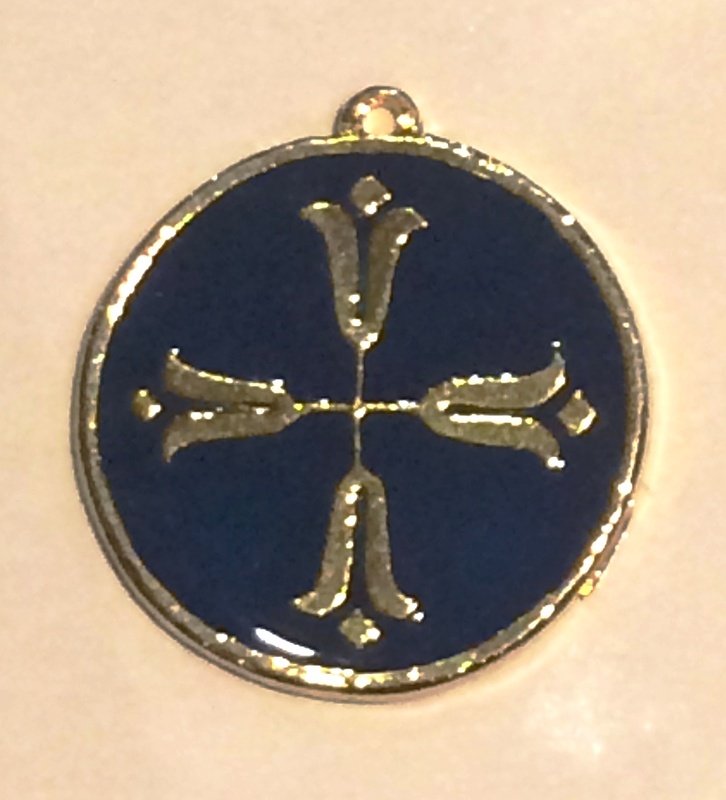 The token is a black/blue pendant bearing the order’s badge: Three lily blossoms in triquetra, Or. The Order confers an Award of Arms to the bearer, if they are not already armigerous. The token for the Order of the Star and Lily is a silver pendant that depicts four lilies with a blue enamelled background, photo by TH Lady Ceara Shionnach. The Taillefer is given to those who by way of performance consistently entertain the populace of the Kingdom. The token is two conjoined silver masks of Tragedy and Comedy. 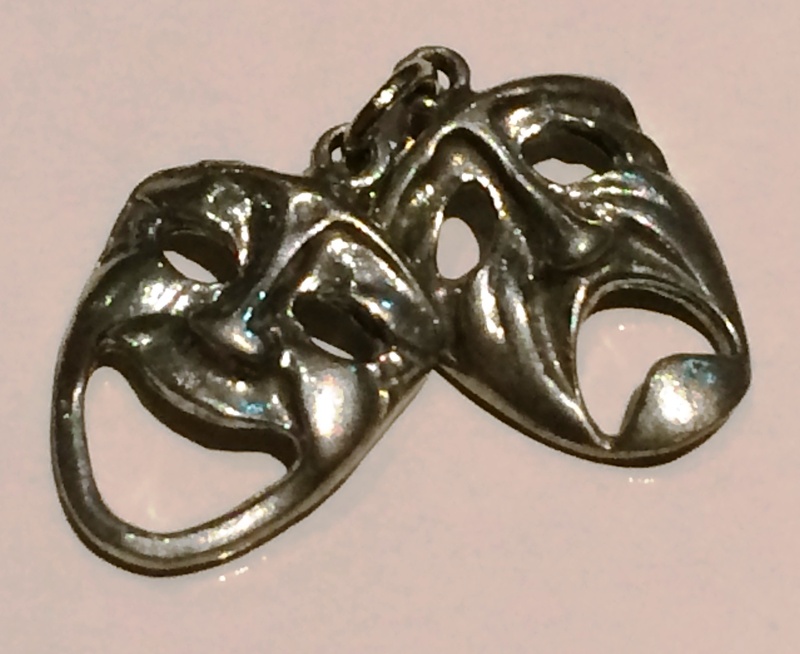 The token for the Taillefer is a silver pendant depicting the dual silver masks of Tragedy and Comedy, photo by TH Lady Ceara Shionnach. The Order of the Rose is given automatically to Countesses by tradition in many kingdoms, including Lochac. There is no rank attached, as the Countess always receives a Patent of Arms with the County. There is no official token for the award. In lochac, the The Order of the Rose comprises those who have served as Consort to the Sovereign in the Kingdom of Lochac, as defined in Corpora. Members of this order are charged with supporting and assisting the Crown and Their Heirs, and encouraging chivalric and courteous behaviour among all members of the Society. The Order is non-armigerous.